Have same functionality and features like the one from the Client Images. Creating and updating an image is only possible from the staff area. To create a new image click the plus (+) button from the bottom-right - “Create Image”. Minimum disk size: The amount of disk space. Minimum required RAM (MB): The amount of RAM. Visibility: Public, shared, community or private. Is protected: Image delete protection. Architecture: Set operating system on 32 bit or 64 bit. OS distro: Set operating system. OS version: Set operating system version. Note that if you try to upload a large image the upload may fail, if so you may want edit nginx configuration and adjust client_max_body_size setting. 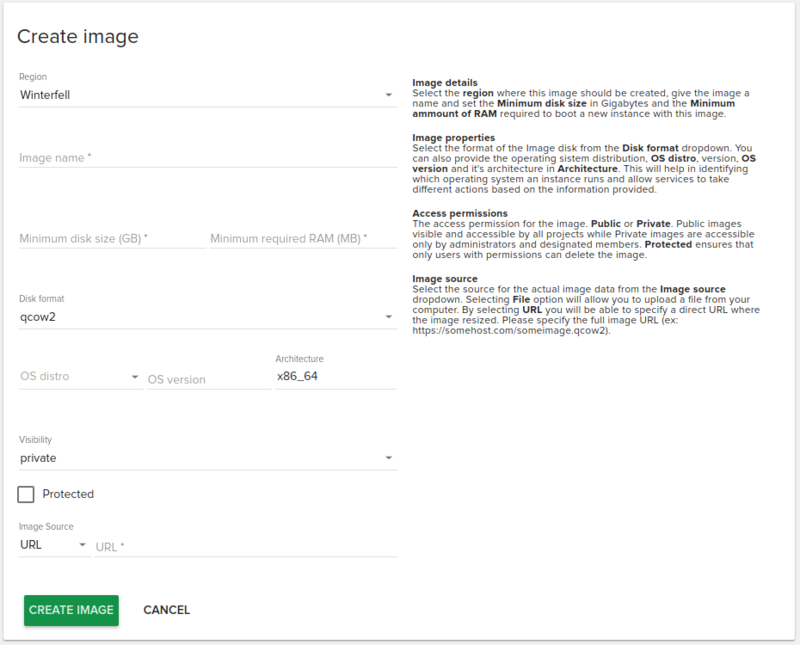 By default Fleio allows image sizes up to 5000MiB. Here you can add custom properties for the image that will be saved in the properties key from the image object. You can add new fields by clicking the + button and remove them by clicking the x button.